Which Piece Of Comic Book Memorabilia Did The Smithsonian Display For Only A Single Day In Early April Of 2015? It wasn’t exactly the priceless nature or the extreme exoticism of the artifact that ensured it was displayed for only a day, it was the tongue-in-cheek prank factor. During the spring of 2015 the National Air and Space Museum in Washington, D.C., a branch of the Smithsonian, decided that the remodeling and rearrangement of the Boeing Milestones of Flight Hall within the museum would be the perfect time for a little light-hearted prank. In a press release on their Airspace Blog in the Behind the Scenes section, they announced that a very special historical aviation artifact was going on display for one day and one day only. 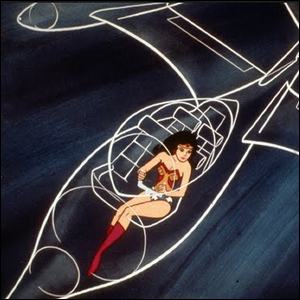 The National Air and Space Museum is proud to be able to present Wonder Woman’s Invisible Plane for the first time publicly in the Washington DC area. Many thanks to the staff at The Museum of Flight and the Friends of the Princess Diana of Themyscira Society for making this once-in-a-lifetime loan possible. Running a museum of such scale is serious business and it’s fun to see the curators take a break from keeping one of the most popular museums in the United States humming along to joke around and engage the public.